Ethics in science Invite me! It’s funny when you start a new business, how many titles you (in theory) could add to your resume, without bending the truth. Today, I was a photographer. We needed a couple of good images for an upcoming ad campaign, so I brought my camera to the lab. Even though we are not nearly close to releasing anything in that area yet, I just figured I’d have to share one picture with you here and now, because it came out pretty damn good, IMHO. 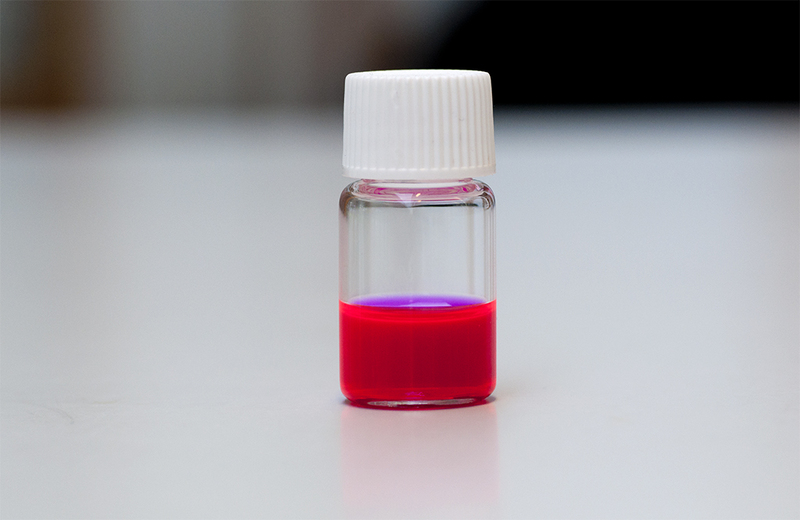 This vial contains a very dilute ethanol solution of an extremely fluorescent organic material that we synthesized. Those who say organic chemistry lacks colors have obviously never worked with highly conjugated pi-systems! Pretty cool. Any idea why the top is purple? Very typical for fluorescent materials; different colors in different angles, among many things. This material looks almost perfectly pink when subjected to natural light, but has a bluish tone under artificial light. Not to mention under the UV lamp. Cool stuff! I could tell you, but then I’d have to DDoS you! Nice vials! Where do you get them?